It’s a slow process and requires repetitions.... but! The repetitions must be done with optimal form. We must start with the set up before we even start to initiate a pull. When initiating the pull, having the shoulder blades engaged back and down (think shoulder blades in your back pockets) will help you use your lats during the pull as opposed to your shoulders. 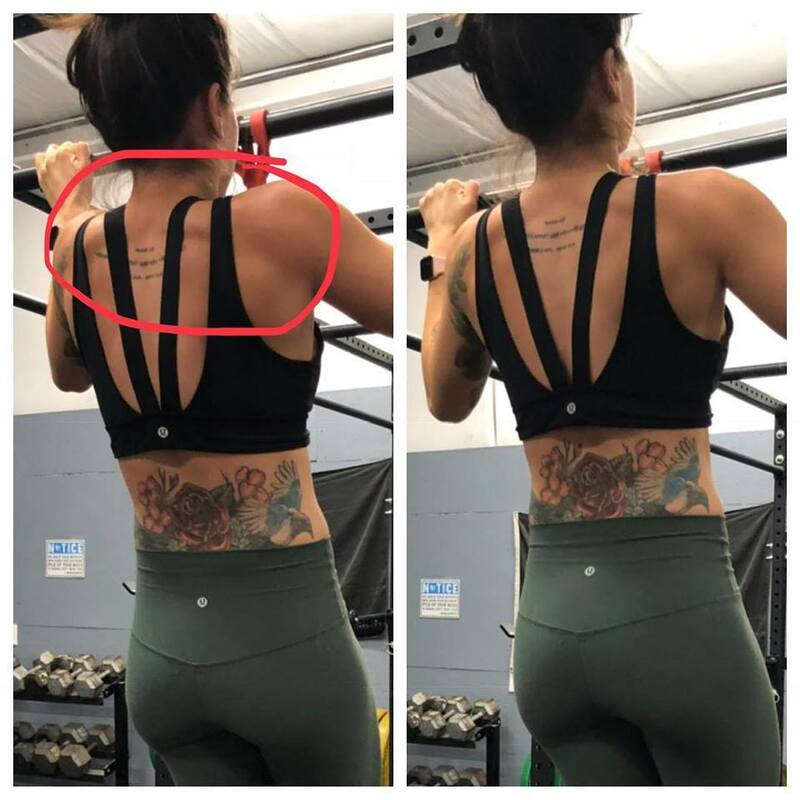 If you take a look at the first image, on the left you’ll see I’m pulling my shoulder blades down (still have some activation of my traps, as it’s an issue I’m still working through). Notice the “openness” of the space between my neck and shoulders. I’ll begin the pull after my shoulder blades are engaged back and down. While in the right image, you’ll see the activation of the tops of my shoulders and upper back; there is almost a crunching up of my upper back, shoulders, and neck. I’m initiating the pull before I engage my shoulder blades, and my lats will have a harder time firing to help during the pull. Notice the decreased space between my neck and shoulders. In the next image, at the top of the pull up, you’ll see the crunching of my neck and shoulders compared to using my back to pull the bar to me. Note how “open” the space is between my neck and shoulders in the more efficient pull. Creating the open space between the ears and shoulders will be key in every single step of this progression. First up, our banded lat pull down. This lightly loaded vertical pull helps us begin the mind-body connection to eventually progress to a pull up. Focusing on form helps to reinforce optimal movement when we increase the load. 1. Lean back slightly at the hips. Ensure the lean back is at the hips and NOT the ribs. Ribs are still stacked over pelvis. Ensure space between ribs and pelvis remains the same as you pull. 2. Bring the shoulder blades down and in, as if you were tucking them in your back pockets. This creates that space between your ears and shoulders & externally rotates your arms. 3. As you exhale, pull the band down. Maintain that space and posture as you begin to pull the band down to the chest. 4. Inhale as you release the band back up. We start with 2-3 rounds of 20 repetitions and will pair this movement with a core stability exercise such as pallof press or a horizontal pull movement such as banded reverse flys. Next up, seated cable pull downs. We continue to reinforce that space between the shoulders and ears, encouraging that external rotation of the arms so that we can utilize the lats to pull. The lats will eventually become a better “puller” but may feel harder to engage and utilize at first! We tend to try to scrunch up and want to use our shoulders to pull (typically with an internal rotation), but this positioning will not help us become better at pulling. We will plateau. 1. Set Up is similar to the banded lat pull down. Slight lean back at the hips. Avoid wanting to thrust the ribs upwards. 2. Create the space between the shoulders and ears, arms will externally rotate as you bring the shoulder blades down and in. 3. Begin to exhale. Maintain that space and posture as you pull the handles/bar down towards your chest. Hold at the bottom for a second or so. 4. Inhale as you release the cables back upwards. We tend to program this movement for 2-3 rounds of 12 repetitions paired with a core stability or horizontal pull movement. Next up, Negative Ground Assisted Pull Ups. We are starting to add body weight to the mix! The same set up as the previous two progressions, but now with more moving pieces (for example, the pelvis will be lifting off the ground now! ), some of our prior tendencies may start to re-emerge. 1. Set the bar at a height that allows you to sit on the floor and fully extend both arms in order to grab the bar. 2. Lift yourself up so that your chest is in line with the bar. Focus on establishing that space between the shoulders and ears, externally rotate in the arms, and engage the lats. 3. Inhale as you lower. On a count of 5, begin to slowly lower yourself from the bar. Maintain that space! Do you feel yourself scrunch up? Do you feel one shoulder pull more than the other? Bring awareness to these tendencies and maybe they may go away. Try to increase the time it takes to descend with each rep! If the movement feels too difficult, bend the knees more. If it feels too easy, straighten the legs more. We program this for 3 rounds with 12 repetitions paired with a stability exercise. Next up, Ground Pull Ups. We are continuing to add body weight to the mix! The same set up as the negative version of this, but now we are pulling up towards the bar in addition to a slow and controlled lower. However, the lower can be sped up just a bit! 2. Lean back at the hips. Create that space between the shoulders and ears, and allow the shoulders to externally rotate. 3. Exhale as you pull yourself towards the bar. Maintain that space! Focus on that very initial pull; do you feel yourself scrunch up? Do you feel one shoulder pull more than the other? Bring awareness to these tendencies and maybe they may go away. 4. Inhale as you lower slowly, and with control. If the movement feels too difficult, bend the knees more. If it feels too easy, straighten the legs more. Same pattern for programming with this; 3 rounds of 12 reps with a stability exercise. Next up, Scapular Pull Ups! We are finally up on the bar! Feet off the ground, adding some more bodyweight to the mix. The Scap Pull Up is the initial pull for a Pull Up. If we can reinforce a good habit here, it should maintain as we add more load! 1. Mount the bar. Feet should be off the ground. 2. Create that same space between the shoulders and ears. Arms external rotate, lats engaged. Same set up as with all of these progressions. 3. Maintain that space as you start the initial pull for a pull up but maintain straight arms. We will program this for several rounds with only a few reps to help create some muscle memory. Now, we are getting towards a pull up! The negative pull up! Use a band as needed! 1. Start with the bar at your chest. Either step from a box or jump towards the bar. 2. Ensure there is space between the shoulders and ears, arms are externally rotated, and lats are engaged. 3. Inhale, and on the count of 5 slowly lower yourself down. Maintain that space! 4. Try to increase the time of each lower! And finally, the pull up. Pull ups require repetitions, but these reps need to be done with optimal form. Our progression helps to set up that form! 1. Mount the bar with feet off the ground. Use a band as needed. 2. Same set up as everything else; space between shoulders and ears, externally rotate the arms, and engage the lats. 3. Start with that Scap Pull Up! Maintain that space!